Last Minute Winter Getaway! High End unit not usually rented. Fantastic golf and tennis community with reduced golf rates and country club access with membership transfer (30 day minimum). This beautiful, newly decorated first-floor corner unit overlooks the 14th fairway and preserve. 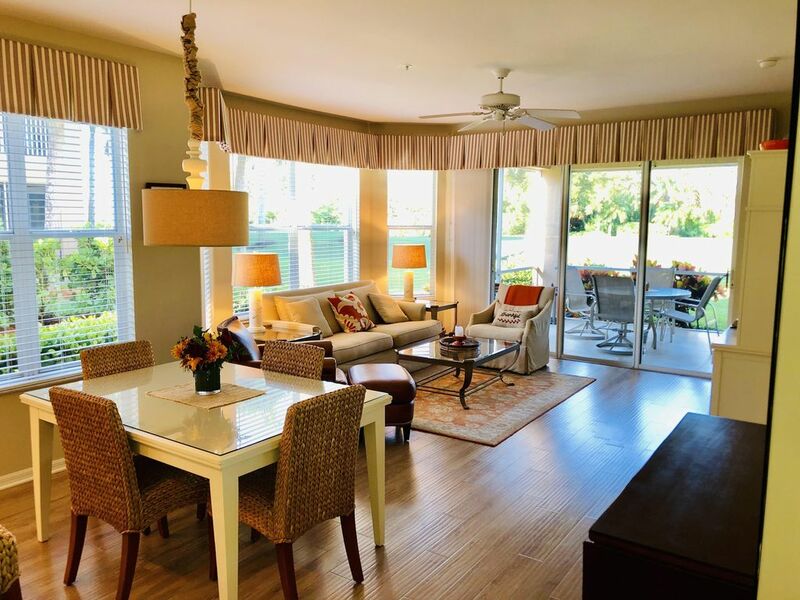 It is 10 minutes to Ft. Myers Beach, 15 minutes to Sanibel Island, 5 minutes to Lee County Memorial Hospital, 5 minutes to Publix, liquor store, multiple restaurants, Walgreen's, 10 minutes to outlet mall and just 20 minutes to RSW airport. The unit has an open floor plan with a spacious dining/living area with bay window. Living area has a 50" flat screen TV/DVD. The master bedroom has a new king size bed, 32" flat screen TV and Comcast DSL service in office area in master bedroom with wireless service throughout unit. The second bedroom has a queen size bed. The third bedroom has two twins and a TV/DVD. There are three pools to choose from, multiple clay tennis courts, fitness center, bocce ball courts, and an active renters social community - cards, art, travel, dance, music, etc. A beach club with tike bar and community room access available. Country club amenities - casual and formal fining within one block. Membership transfer available for a fee. Love the location. Can accomplish as little or as much as you want to in a day!!! Additional folding dining chairs available in closet. Table has leaf under bed/seats 8. The property was perfect for my wife and me. The first floor access was great for bringing in groceries or moving in and out. Location was very close to the clubhouse and shopping was less than a mile away. The remodeled kitchen was a plus. Thanks to Jack and Karen for renting to us. Closest golf community near Ft. Myer and Sanibel beaches. 20 minutes to RSW, 2 miles to Lee Memorial Hospital. This unit rents from the 1st of the month until the last day of the month during high season Jan-Mar.